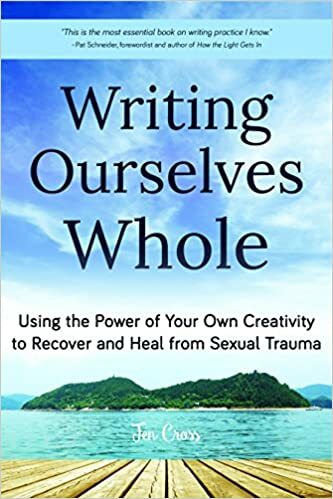 Chatting with Annie Schuessler on the Therapist Clubhouse Podcast! Posted on September 28, 2018 | Comments Off on Chatting with Annie Schuessler on the Therapist Clubhouse Podcast! If you’re torn between social justice and making money, you’ll want to hear this honest conversation. 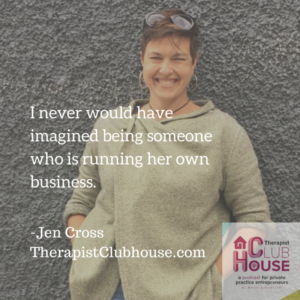 My guest on Therapist Clubhouse this week is Jen Cross. Jen is a visionary, author, healer and workshop leader who’s helped hundreds of survivors, but still struggles with the business side. This episode is a rare opportunity to go behind the curtain and hear some honest talk about business. Jen talks about the difficulty of finding a balance between serving her community and sustaining herself financially. You’ll also hear me slip into some unrequested coaching. Oops. I usually coach only when I’m wearing that hat. Listen right here if you like. I never would have imagined being someone who is running her own business. Survivors are willing to take risks, can persevere and tend to be hopeful, continue to move forward and wake up every day and keep going even though we know things that are gonna be hard. We are deeply generous and deeply creative. Those are foundational, useful traits in somebody who’s running their own business. Deep social change is slow work. It goes through cycles where it looks like it’s getting better and then it looks like everything is getting worse and it’s never gonna change. It’s not gonna end in my lifetime. When I am deeply anxious about money, I am less present. I’m just not able to be in the room in the same way.